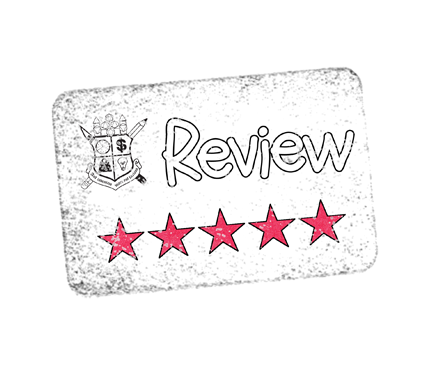 This week I picked up a cool little supplement that is currently a Silver Best Seller over at DriveThruRPG, and after reading it I can see why. 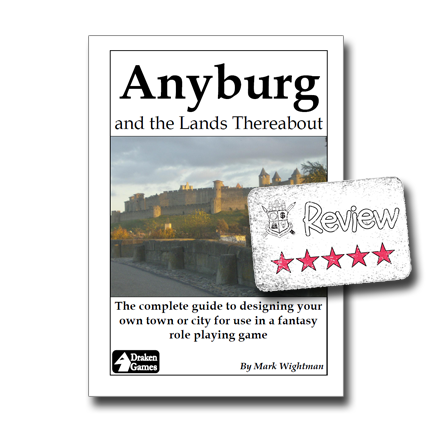 Anyburg and the Lands Thereabout: The complete guide to designing your own town or city for use in a fantasy role playing game (say that 5 times fast!) is actually a bit of a misnomer. Oh, it definitely does help in designing your own town or city, and it does actually give you a City of Anyburg, but it does a bit more. This PDF is 50 pages where roughly 1/2 have is a great analysis and explanation of some historical data with the other half consisting of examples (real-world and fantasy) and some resources. The PDF is sized A4 for printing and is secured, but not needlessly so. Honestly, I was sold on the 1st page of text, which thankfully is available to read as part of the full-page review. Mark Wightman, the author, does a great job in the introduction of setting the stage for the rest of the book. He sets up a great framework for what he's trying to accomplish and I think he pulls it off: "What I propose is to set down a set of fairly straightforward principle that you can use to help design your own town or city. You can use all the elements I suggest or you can disregard or alter them as you see fit. This will ensure the final product is tailored to fit you campaign world." Mark goes on to state that the idea is to establish these basic principles that are grounded in enough "fact" to be believable for the players without muddying the waters, so to speak, with details that, while realistic, take us out of the fantasy element. Throughout the book it is obvious he is using some historical data to serve as the foundation, but he's done some additional research and tweaked things to help fit the needs of the RPG world. Everything is explained just enough and with an attention to detail from the GM's perspective. I found some great insight on a few topics I hadn't actually thought of before, but now make complete sense. I actually feel smarter for the experience! There is a good flow to the PDF, and I really liked how this wasn't just about building the population of an urban area, but also how to lay one out graphically and even the zone of influence around these areas. This is where I think Anyburg really rises above the raw data that most GM's have seen before. The research and explanation of some of those numbers is what really makes this download a value-added look at resources otherwise freely available. Overall I really liked this PDF, definitely worth the $5 I spent, but I do wish that Mark had done a better job with the art used. I'm not saying the art itself is bad, just that I think the maps uses weren't all that great (they do work though!) and I wish he'd properly credited all the artists used. I realize this may be nit-picky, but his credits page is half-empty and the sum of the art credits is one sentence. Not cool Mark, not cool. I'm sure that most of those pieces are Public Domain, but I'm certain they are not all from unknown artists. Truth be told I might not have even noticed that attributions if I haven't been working to find art & do proper attributions myself. If this product ever gets an update I hope they'll fix that minor, but important issue.